You know that high quality, healthy, productive soil is the foundation of a strong, sustainable agri-food system. 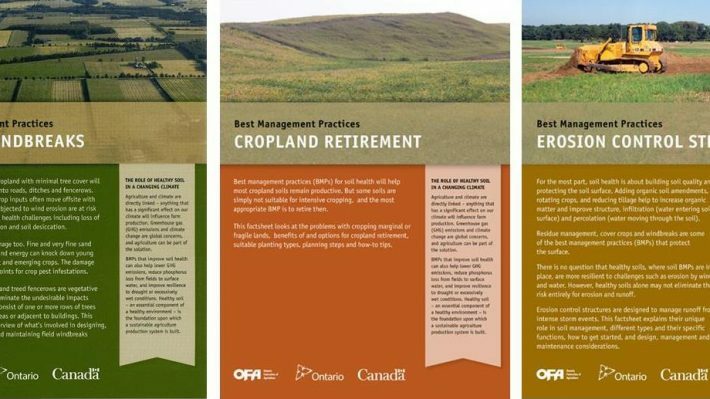 These publications, part of our Best Management Practices series, can help you plan and implement practices to improve soil health and increase yields. Unfortunately, the health of Ontario’s soils is on the decline. While many farmers practice good land management practices, there is much more that can be done to improve soil health and protect soil for long-term productivity. Our soil health publications were developed to support the upcoming Agricultural Soil Health and Conservation Strategy. We’re working in partnership with stakeholders and experts to develop the Strategy with the goal to sustain Ontario’s strong agricultural production while protecting the environment and adapting to a changing climate. All of the titles can be ordered through ServiceOntario once published. You can find the ordering information on the Soil Health in Ontario web page. Do you have soil health questions? Contact our Agricultural Information Contact Centre at 1-877-424-1300 or ag.info.omafra@ontario.ca.